Cause related initiatives are important to our culture. We welcome your ideas in helping us help others. Reducing landfill waste by making our protectors with a 5 year life span, and by reusing, recycling or reclaiming waste materials whenever we can. Making all marketing materials available in digital formats that can be supplied over the internet; and when printed, only on post consumer papers with environmentally sensitive inks. Refining our production processes to engineer out any adverse effects on the environment. Fund raising for community initiatives. See what we’re doing for Breast Cancer Research. Giving support to local food banks. Supporting community centers that offer programs for the economically disadvantaged. CPE gets involved in Fort McMurray Wildfires, Read More! Encouraging our stakeholders to become more actively involved in their local communities. Giving back to the community should be a part of every successful organization, and we believe in sharing the opportunity to do so with our valued business partners. One of CPE community support initiatives is a program that partners with you to support Breast Cancer Research. 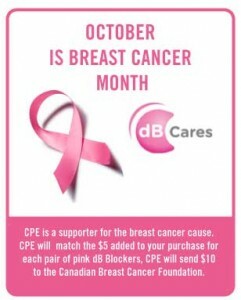 By matching the $5 added to your purchase of each pair of pink dB Blockers, CPE will send $10 to the Canadian Breast Cancer Foundation. The pink ear-piece shows that you are a supporter, and an active participant in your community’s support network. Cause related initiatives are an important part of the CPE corporate culture, and we welcome your ideas for helping us expand our programs in cancer research, autism support, education for better hearing health, and more eco-friendly ways of doing business. Custom Protect Ear (CPE) reaches out to a struggling family in Phnom-Penh Cambodia to provide a home for the family of six to live in. Through the humanitarian organization of World Housing with their mission of “A home for everyone”, CPE Chairman, Jeffrey Goldberg and President Howard Raphael at CPE contributed $5,000.00 to build the home that now provides security and stability for Sam and his family. Read Full Story..
CPE raises funds for Canucks For Kids Fund (CFKF) through the sale of their Canucks branded dB Blocker™ hearing protectors. Custom Protect Ear (CPE) will donate $5 to CFKF from every sale of their Canucks-branded dB Blocker™. The Canucks for Kids Fund dedicates resources to assist charities which support children’s health and wellness, foster the development of grassroots hockey, and facilitate and encourage education in BC. 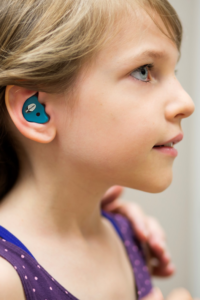 Brie is a vibrant young girl living with a mild case of autism, and Custom Protect Ear is happy to help her manage her sensitivity to noise. Brie is a proud owner of her own personalized dB Blockers that assist her in coping with noise in her environment. “I cannot thank you enough for the custom pieces you made for my daughter’s ears. For more information regarding dB Cares™, or how we both might become better partners in cause related initiatives, call or email us. We’d love to hear from you.